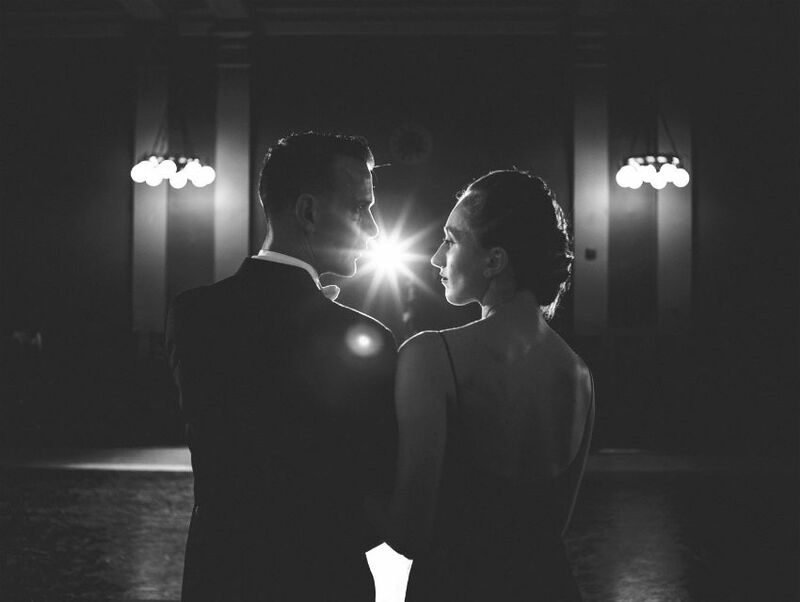 For the first time, American Contemporary Ballet is performing in the Farmers and Merchants Bank Building downtown, presenting a program of George Balanchine and Fred Astaire. The historic space, built in 1905, no longer operates as a center of high finance, but its Corinthian columns and other Romanesque details remain. Perhaps it makes sense, then, that a dance company would re-create the works of two of the most accomplished classical choreographers here. For Music+Dance:LA I, a run of six performances from June 19 through 21, artistic director Lincoln Jones is featuring Balanchine’s Valse-Fantaisie and five pieces from the Fred Astaire/Ginger Rogers canon. The audience will be seated at stage level, and a reception will follow, with drinks, live jazz, and a chance to meet the artists. We spoke with Jones about his summer series. Balanchine and Astaire were contemporaries. Did they influence each other? They were extremely similar. They shared a proficiency with the craft of choreography (especially in the musical aspect) that went far beyond anyone else. Astaire was Balanchine’s favorite dancer, and he so admired him as a choreographer that he compared Astaire’s invention to Bach’s. Why did you select Balanchine’s Valse-Fantaisie, with its nonstop jumping and waltzing? It’s a really nice contrast to the Astaire. The audience will get a full and varied program, but there is a deep connection in the two men’s work at the stylistic and musical level. I like programming that contrasts on a superficial level but connects on a substantial one. Valse-Fantaisie is a pastiche. Balanchine is drawing on some of the visual forms of romantic ballet, but with his incredibly amplified speed and more dynamic movement. It is only a ten-minute ballet, but with probably as many, or more, steps as a full act of a traditional romantic ballet. Which five dances did you choose for the Astaire/Rogers part of the program? I’ve decided not to reveal which dances we’re doing this year, ahead of time. I want the audience to be surprised. What I can say is that they are five of Astaire’s best and most famous numbers. Of course, it is hard to pick from among Astaire’s prolific output which single dance is the very best of all, but we have one or two here that would be contenders. We have some new dancers performing this year. Eva Burton and Kaila Feldpausch will be featured in two of the new dances, and Cleo Magill, who is one of our best Astaire dance interpreters, will be performing something new (she performed “Smoke Gets in Your Eyes” in May). Do the dances have similar tempos or choreography? Astaire styled his dances according to the strengths of his partners. These are all dances he did with Ginger Rogers. She was very rhythmic and nuanced, and a good tap and ballroom dancer, so the dances tend to focus on those strengths. Each has a range of tempos in it, which is common with Astaire. They ebb and flow so that each dance is a full ride. The moods vary—there is intimacy, longing, joy, comedy—but with Astaire, practically each phrase has its own mood. You’ve referred to Astaire’s rhythm as “just about perfect.” What do you teach during class so that the dancers come to feel that rhythm? When I first re-create the dance, I focus on the rhythmic structure of the choreography so that that aspect is most prominent in the dancers’ minds. If any passage presents specific rhythmic difficulty, I might have the dancers clap the rhythm, making sure it is sharp, and making sure they are accenting properly. But probably the biggest tool is choosing dancers who are musical and have a natural affinity for this type of movement.